Back Row L to R: Farm owner, Rita Kent, farmer, Jean Donovan, Janet Macky, farmer, Sharon Abernethy, Karen Lucas, Rita Cutforth, farmer, Hillary Robertson. Front Row L to R: Carolyne Gatenby, Andrea O’Brien, two farm children, Christine Lewis. 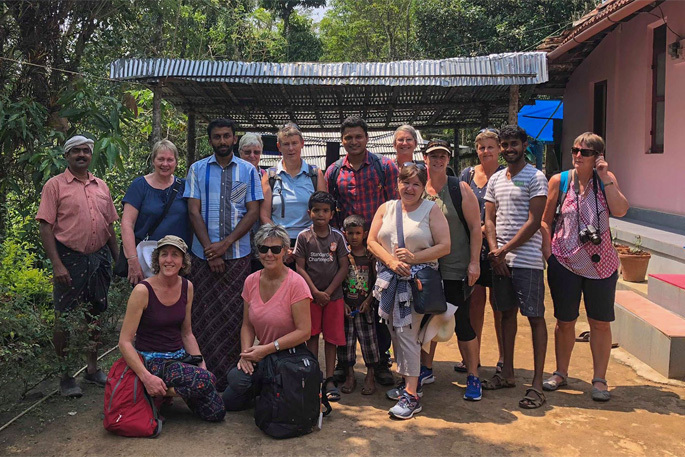 When you hear that 10 women from rural Paterangi, near Te Awamutu, spent three weeks travelling around India with an English-speaking guide in a 26-seater bus, there has to be a story there. The women met while their children were at Paterangi School, and for around 15 years have shared outings and weekends away. In March 2018, they decided to embark on something more adventurous. On behalf of the group, Jean Donovan, Rita Cutforth, Carolyne Gatenby, Janet Macky and Sharon Abernethy congregated to discuss some of the farming practices they saw during their journey around southwest India. The Wayanad district is the least populated area in Kerala state and is mainly a farming community. The farm the group visited extended to around five acres. They saw numerous fruits and crops being grown, including rubber, spices, coffee, bananas, bamboo, cashew nuts, beans, papaya, pawpaw, peppers, chilli peppers, cardamom and rice. Unlike New Zealand’s organised farmscapes, the Indian farm has few fences, and crops are separated by raised dust walking tracks, some of which are just wide enough to take a little tuk-tuk van. Wild boar are a huge problem in rural India, causing extensive crop damage and attacking humans. As the boar is considered sacred by Hindus, the dominant religion in the area, they cannot be killed. The farm has a small hut where at night, a watchman keeps guard against any marauding boar. There was a noticeable drive towards an organic, sustainable environment, with no evidence of spraying. While some older machinery was being used, the farm was very labour-intensive, with much of the work carried out by women. An ox and cart was still used, and produce was taken to the co-operative in the nearest village on the back of the tuk-tuk. Water came from their own well and there was electricity on the property. During the visit the women were treated to a traditional vegetarian meal, served from banana leaves, washed down with spiced coffee grown on the farm. The group were amazed at the acres and acres of rice grown in the Alleppey area of Kerala, where the 900km of waterways provide the water source for flooding the paddy fields. They toured some of the waterways in a converted kettuvallam houseboat (rice barge). The fields are drained and the men harvest the rice and deposit it into large piles on tarpaulins to dry by the roadside. It is manually shovelled into jute sacks and transported away in trucks or on traditional rice barges. Women then stack the rice plant stalks into ricks to dry it into straw to feed cattle. The field is burned by hand and the preparation, flooding and planting process begins again. Ooty is a hill station in the Nilgiri Hills of the Tamil Nadu state. The higher altitude and accompanying climate are the perfect combination for growing tea. “Camellia sinensis, the camellia variety grown for tea were interspersed with pollarded grevillea robusta trees to shade them. Pepper vines were grown up their tree trunks,” says Jean. The men took over once the women brought their tea down from the slopes. Although basic by NZ standards, the tea processing factory had the most automation the group saw during their trip. The tea was dried on large tables, but the grinding and processing was mechanised. Then the tea is packed and boxed on the premises for sales and export. The group tasted several of the flavoured teas made at the plantation. Clearly exhilarated by the memories of their adventure, and fascinated by rural practices of another country and culture, these intrepid travellers are already planning their next trip.